These special 6/8 razors were created by Master Aust and were manufactured in a traditional Viennese jewellery workshop. As the razors are handmade, each of them is unique and differs in its design. The razor shells are made of Grenadilla wood and are decorated with delicate silver. All the applications were elaborately made by hand. The Spanish head razor has a rounded “tip” to facilitate the blade’s manoeuvrability. The blade width size is 20 mm (6⁄8 in).The width of the blade is defined as the distance between the back of the blade and the cutting edge. It is expressed in units of eighth of an inch. 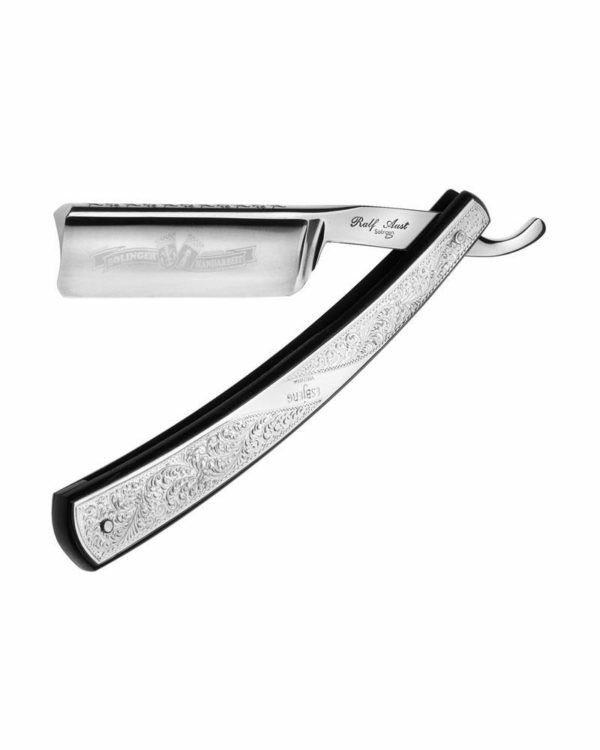 A narrow blade can shave tight facial spots such as under the nose, but must be rinsed more often. The blade is made of stainless steel, which is resistant to rust but can be more difficult to hone. To avoid water spots or rust, the blade must always thoroughly dry. Blades, which have not been used for a long time, need to be treated with oil. renadilla or African Blackwood has been used in Europe for 500 years. Initially, it was used to manufacture musical instruments. It is one of the hardest woods worldwide and displays a particularly beautiful dark brown to black grain. The high density and hardness of this natural material predestines it as a wet shaving accessory.